How long will it take if I order an outfit today? Below each product, you will find its estimated shipping time. This is the approximate time by which your order is shipped from our facility. We may be able to ship some outfits earlier - we request you to get in touch with us if you need early delivery. Be sure to mention the name of the outfit along with the size you need. Can I get rush delivery on an outfit? We may be able to process your order on priority on request. However, this is based on certain dynamic production factors. So please do check with us if you need rush delivery on any outfit. Please note, orders processed on priority will need to be prepaid. Why are your timelines so long? Our timelines are slightly longer because these are specialized garments involving extensive tailoring, embroidery and finishing. Please rest assured, the time spent on your outfit ensures it is carefully crafted to meet high standards of quality and finishing. How long does it take, once my order is shipped? Can I get delivery on a specific date? We can undertake an assurance of a specific shipping date on request. However, once an order is shipped, transit times are subject to various factors beyond our control (such as shipper transit schedule, octroi/customs clearance/weather conditions/location specific holidays and so on). Hence assurance on specific delivery dates is something we will not be able to undertake. Returns are accepted as long as the item is returned at our facility within 7 calendar days (strict) from the date you receive the order. We issue a full store credit with lifetime validity against returned items. For more about the return process, please click here. Please be sure to check the list of items not eligible for returns below. Order Item should not be deemed unfit for return by our QC team for any other reason whatsoever. You need to raise a return request by email or phone. Your invoice has a return label attached to it. Simply pack your item the way it arrived and ship it back to us with the return label on it. Be sure you have checked if your order item is eligible for return and meets our quality control conditions. You can get always in touch with our customer care team and they will be happy to assist you further. How do I exchange the outfit for a different size/ outfit? Exchange works exactly like returns; we will issue you a store-credit and you can place the order for another size or a different outfit using the store credit. You can cancel your order within 6 hours of placing your order on the website by mailing us at "orders@6ycollective.com". Cancellations will not be possible after this time period. However, you can always return your purchase – refer to our Returns Policy below. Do you have any physical retail stores? We do not have any physical stores currently, and we exclusively retail through our website. 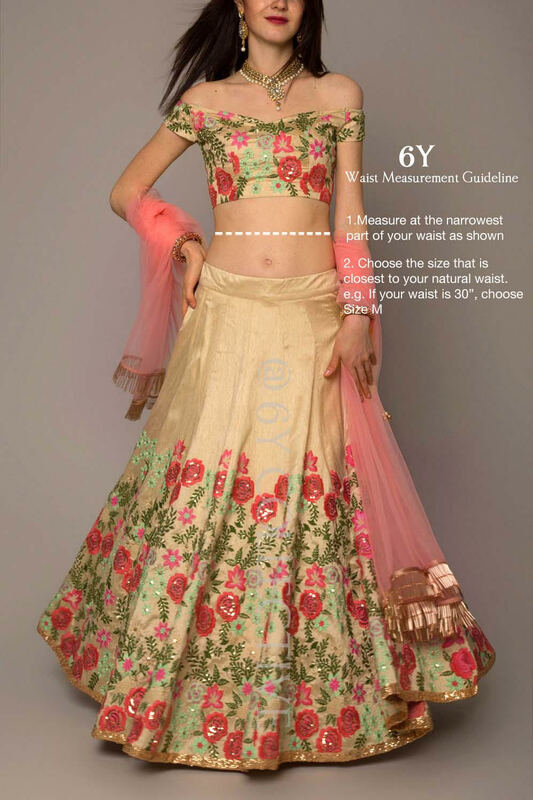 We understand that with Indian clothing, sizing and fit can at times be tricky when you are shopping online. So if you have any questions around sizing, fit or styling of our outfits, we are more than happy to help you. You can also take a look at see real/candid images shared by our customers in our Customer Stories. This should help you get a better idea of the work we do. Our collections are limited in inventory reaffirming our commitment to exclusivity . We rarely accept orders for sold-out outfits. However, you can drop us a mail requesting for a sold out item, you will hear back from our team if we can make the outfit on request. 6Y is a premium private label - We combine heritage Indian embroidery and artwork techniques with contemporary and sharp tailoring standards to create outfits that are both glamorous and practical. Most outfits we make are in limited edition reinforcing our focus on individualistic style.We follow the most stringent quality standards for our garments. Everything from design, production to sales is handled entirely in-house. We offer the following customisations at an additional charge. Please note that customized orders are not eligible for COD/ Exchanges or Returns. 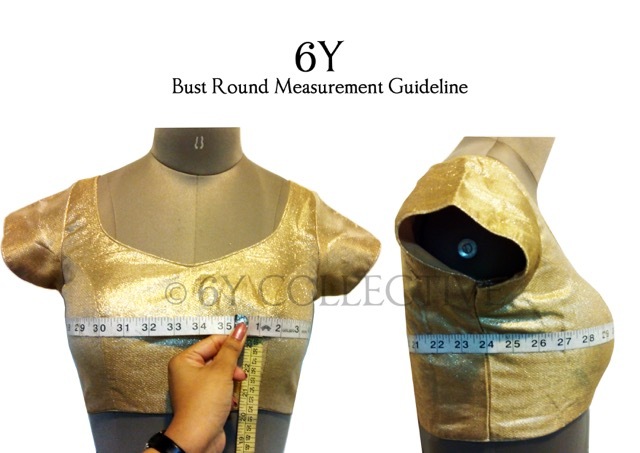 Blouse Stitching: We tailor blouses as per standard bust sizes. Please refer to our Size Chart for choosing the right size. Our blouses are usually padded (unless mentioned otherwise) and come with up to 3-4 inches margins for you to make adjustments if needed. Non-Standard Size: We take orders for petite and larger size outfits on request - XXS, 2XL, 3XL and 4 XL. These sizes are graded per our internal measurement guidelines based on the bust size, we will get in touch with you in case we need any additional measurements. Please refer to our Size Chart for choosing the right size. We ship our merchandize world wide. International shipping might take up to 4-5 weeks for delivery. We ship via DHL/FedEx, and you will receive a tracking number as soon as we ship out your order from India. Our shipping charges are calculated on actual weight of your order items. The total shipping costs applicable on your order will be shown at the payment details page once you fill out your shipping details at the time of placing an order. 6Y will be responsible only for shipping your order to your destination country. Any clearance charges, taxes, import fees or duties applicable at the destination port will be borne directly by the customer. The shipping charge levied by us includes the cost of freight alone.